It is always exciting to be in Dubai. No matter how not far your latest visit was, you will always be surprised to see how many things have changed and how the city has developed further, with the positive and negative aspects that comes along with the change. The landscape now is dominated by Burj Dubai, the world’s tallest building, which is high enough now to become the leading character in the city Landscape. Metro Dubai, the ambitious public transport project in progress to solve the ever increasing traffic problem of the city is also visibly showing across Dubai as it reaches advanced development levels. And of course, on a smaller scale (yet with huge billboards), many new brands have emerged- and many other existing brands have been re-branded and re-presented with a new look and feel. My interview on the Dutch TV Documentary Tegenlicht mainly was over the “identity” of Dubai and discussing the image and reality of the city from an internal and external point of view. Dubai, The Emirates, and the Gulf in general have been an important center of attention across the world. Which is one of the reason why the Dutch TV Channel VPRO decided to dedicate an episode of its award winning Documentary series, “Tegenlicht”, on the United Arab Emirates- with a particular focus on Dubai and Abu Dhabi. The weekly broadcasted informative program Tegenlicht is a series in which new ideas and trends in politics, economics, society, science and culture are explored. The main purpose of the program is to create an understanding of the way society orders itself both in the Netherlands and abroad, with a focus on analysis of the factors and influences that play a role in these developments. While most of the world’s media are focused on the Middle East as a region of conflict , a “silent revolution” is taking place in the Gulf states: Tegenlicht’s special episode, “The Rising Gulf” will focus in a 50 minutes documentary on this rapid modernization process which is taking place in this part of the Arab World, one that has never been seen before. I have accompanied the VPRO team to the UAE; on one hand to support them with my suggestions on interesting aspects and people to investigate in Dubai; and on the other hand to be interviewed in the documentary on the issue of the “Identity of Dubai”- and my critical understanding of the image and model the Emirates its projecting to the outside world. All from the dual perspective of a person who has lived in the Gulf; and who visits and observe the Gulf from the outside on a professional, cultural, and personal level. The Program will be broadcasted in Holland in the last week of January / first week of February. It will showcase as well Marwa Hashim, one of my previous students from the American University of Dubai, who is a great example of the new generation of Local Emiraties expressing their talent and ambitions within the rapid changes and development of the UAE. Arabic Wordmark we developed for Wafi Mall in Dubai- seen above on various external graphics. The long process of the word creation was based eventually on an old architectural calligraphic engraving done for Wafi. Beside the Tegenlicht Documentary; it is always exciting on a personal level to be in Dubai as I often get to see some of the projects we have worked on at Tarek Atrissi Design, in context, for the first time. This trip was a chance to see several of our typographic “fingerprints” around the city. The Arabic Signature / lettering of the new brand of Etisalat, the UAE’s national telecommunication company, is as part of the brand literally in every corner of the city. The Arabic wordmark for WAFI shopping mall- which we have developed at part of the larger re-branding project of WAFI mall, is finally implemented and was a pleasure to be seen on the pyramid shaped building and the banners and environmental graphics of the mall. More recent is typographic voice of MTV Arabia, which we developed in the form of an Arabic and Latin Typeface for the channel, which you could see on mega-large billboards across Dubai. Etisalat became one of Dubai’s most visible brands today. The Arabic lettering we developed has been an exciting element to constantly be seen across the city. 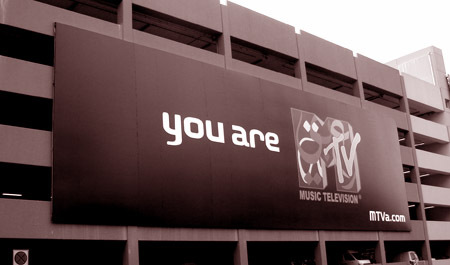 Billboard promoting the new MTv Arabia with its slogan “you are MTV”- in the MTV Arabia font.